The aims of this book are twofold: on the one hand, based on archival research, it seeks to identify the status of film and of the moving image in the field of contemporary art in French-speaking Switzerland and abroad; on the other hand, it aims at assessing the influence of exhibition contexts on a multiplicity of film practices (on their temporal aspects, the multiplication of surfaces of projection, the reception by a mobile spectator). 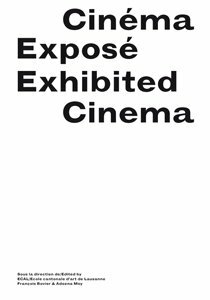 The first part brings together theoretical or historical essays and interventions by artist and filmmakers to offer an overview of film in exhibition contexts. Stemming from a study day jointly organised with the University of Lausanne, the second part maps Expanded Cinema in Europe, which unfolds through less spectacular strategies than in the United States. This book concludes with the republishing of a UNESCO report on the state of video art written in 1983 by René Berger. Published as part of the eponymous research project conducted by ECAL / Ecole cantonale d'art de Lausanne, directed by François Bovier & Adeena Mey, and funded by HES-SO / University of Applied Sciences Western Switzerland. - Erik Bullot, Suis-je vivant? - Malcolm Le Grice, Expanded Cinema–Where Now?